A 9-year veteran in the data analytics business, Simone Clancy shares her career path and thoughts with upcoming women in technology. Last month I was fortunate enough to engage with the next generation of women leaders in technology at the Melbourne DataGirls event where a recurrent question was how I got my start. I’ve spent a good part of my career in the field of analytics – 9 years at Yellowfin and counting, and while I briefly dallied with BASIC at high school, my entry into the industry was primarily due to a single semester subject Microcomputing Applications for Arts Students while completing my Bachelor’s degree. This, I successfully argued in my application for a job with Systems Integrator Unisys was proof of my deep interest in IT! To my everlasting gratitude, they accepted this on face value. When plans for a business consulting practice evaporated, I found myself in a technical role, and here my real career in tech began. I connected with my inner geek, and I’ve happily spent the last 20+ years building a career in the industry. Out of university I was filled with a little knowledge and a good deal of youthful drive and arrogance. Open to new experience, I was quick to seize every opportunity that came my way, and in a services company, there were many. At no point did I consider myself under-qualified or contemplate that I was anything less than equal to the task. It certainly helped that I’d experienced little gender bias at this stage of my career. While I’d like to think that arrogance has been supplanted by wisdom, I often wish I still had the same confidence to embrace uncertainty and the new. 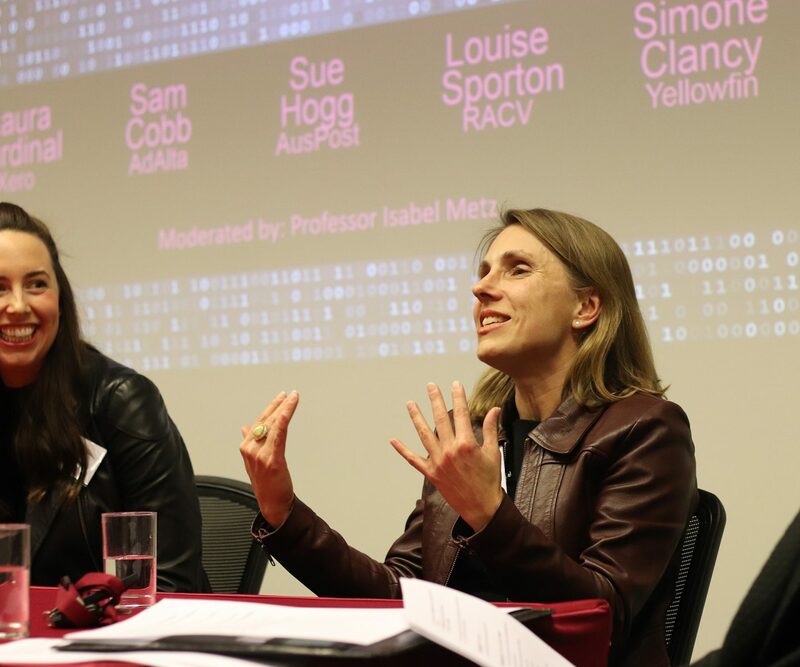 A couple of weeks ago, I found myself back where it all began, part of a panel of female tech leaders at the Melbourne University’s Melbourne Business School – Women in Tech event. I was struck by how diverse my fellow panelists’ experiences had been and yet there were common themes. While all had an obvious passion for technology, few had an immediate start in tech or a predictable career trajectory. All had drive. Many spoke of being empowered by mentors. All were keen to empower others by promoting the involvement of women in technology. Many, myself included, spoke of being lucky. While I consider myself lucky to be in an industry that allows me the flexibility to have a career and be a hands-on parent, and privileged to have had a great education, I’ve worked hard to deliver results and shouldn’t be afraid to celebrate the fact. It’s an interesting trait I’ve observed in successful women: You don’t often hear men talking about the role of luck in their careers. While I and the other women on the panel have experienced success, it hasn’t always been straightforward. There was a lot of discussion and concerns were raised about the barriers to women in technology. Certainly, the statistics aren’t encouraging. The average rate of female participation in the industry is 37 percent as opposed to 46 percent in the workforce and has fallen in contrast to the strides made in other areas. The numbers of women undertaking studies in tech has steadily decreased to around 18 percent, less than half of the high point of 37 percent in the 1980s. Based on my own recent efforts to improve Yellowfin’s gender balance, I know it’s difficult to find women via the traditional channels. Our direct involvement in DataGirls and similar initiatives, apart from being a fundamental requirement of being a decent corporate being, are key to our recruitment strategies. The increased focus on ensuring gender diversity and promoting the involvement of girls in STEM is heartening. It needs sustained attention over time before we will hopefully see participation trending toward parity. Pursue every opportunity – it’s how you build your foundation, grow your skills, work out what you’re good at and what you’d most like to do. Don’t let a lack of formal qualifications (or much less) experience deter you. Seek out inspiration and mentors who bolster your confidence (and provide the challenges you need). In her current role as Director of People Strategy at Melbourne-based global BI software developer Yellowfin, Simone is committed to promoting the involvement of girls in STEM and gender balance in technology. Connect with her on LinkedIn.